The same size as Trafalgar Square, Granary Square is at the heart of King's Cross where the Eurostar departs and emerged as part of the 2012 regeneration of the railway station. With over 1,000 choreographed individually lit fountains in the middle, and historic buildings - including the Granary Builiding - surrounding it, the canalside square is a natural meeting place. There's room for 2,000 people to sit on deckchairs and enjoy a concert or a summer movie, and the square has hosted musical festivals Traction and Africa Express, as well as The Big Dance and an ice cream festival. It occupies a spot where barges once unloaded their goods and there are wide, south-facing steps sweep down to the canal. 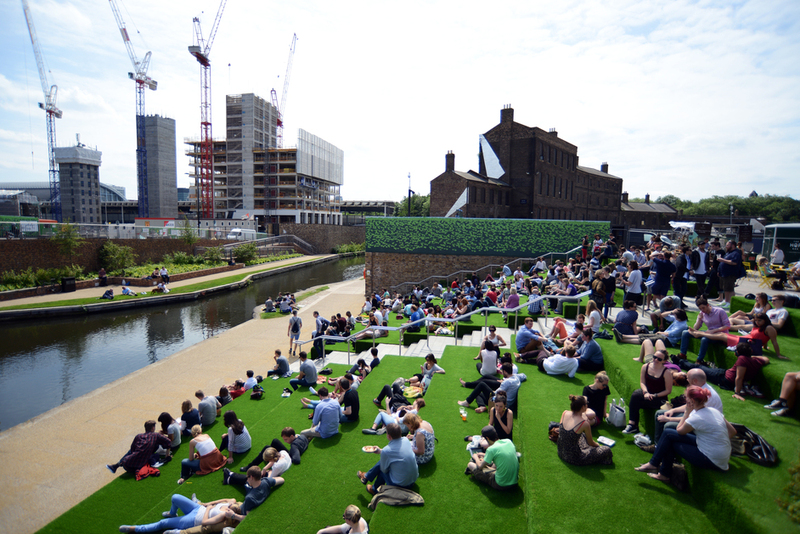 What are the best dining options near Granary Square London? Granary Square gyms, sporting activities, health & beauty and fitness. The best pubs near London Granary Square. Granary Square clubs, bars, cabaret nights, casinos and interesting nightlife. Where to have your meeting, conference, exhibition, private dining or training course near Granary Square. From cheap budget hotels to luxury 5 star hotels see our discounts for Granary Square hotels, including DoubleTree by Hilton London - Islington from 79% off.